The air is starting to get crisp and the apples are coming in. 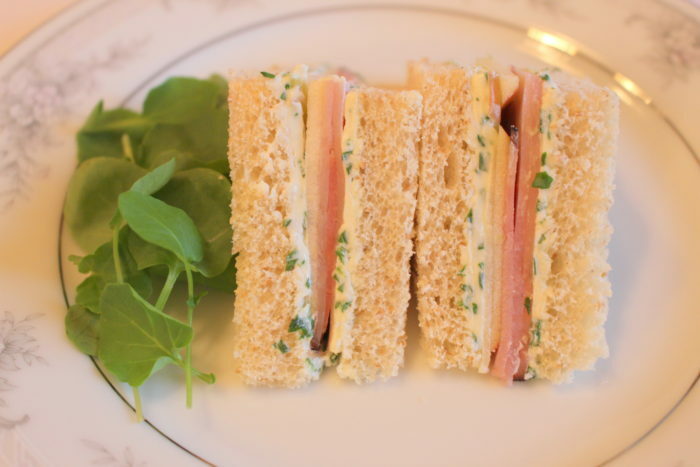 Enjoy the fall harvest with an easy and elegant Ham, Apple, & Goat Cheese tea sandwich for your next get-together with friends. Take fresh watercress and rinse it. Click here if you’d like to learn more about the health benefits of watercress. 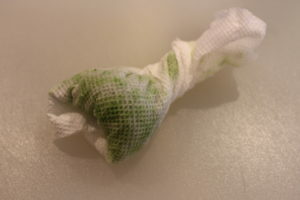 Here’s a tip for you: take your chopped herbs, bundle them up in a paper towel and squeeze the moisture out. This will prevent clumping. 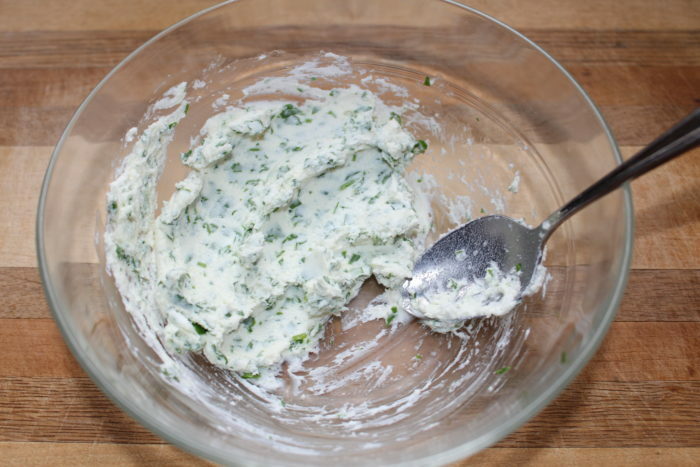 Mix well with the goat cheese. 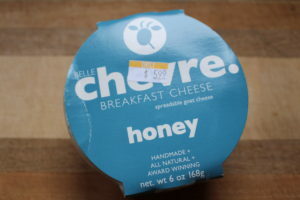 I used award-winning Belle Chevre Honey Breakfast Cheese. This smooth, spreadable cheese is a favorite of mine because the sweet honey softens the tangy edge of the cheese. 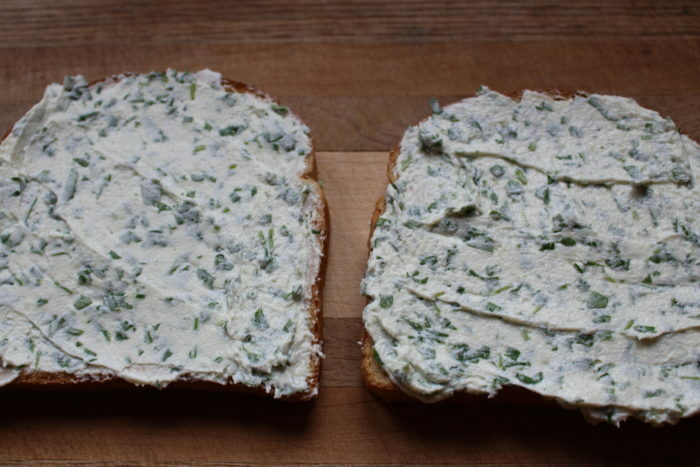 Blend the cheese and herbs together and spread over your favorite slices of bread. I used Nature’s Own Honey Wheat Bread because I thought the honey bread would go well with the honey goat cheese and the honey maple ham but a thinly sliced pumpernickel or a homemade whole grain bread would be nice too. Thinly slice your apples. I used locally grown Pink Lady apples from Isom’s Orchard. Orchard apples are so much better than grocery store apples. It’s almost as big a difference between fresh tomatoes and store-bought. 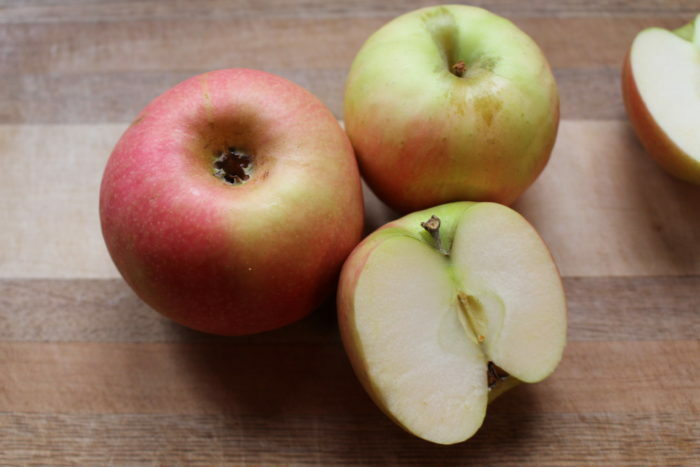 The Pink Lady apples are the perfect combination of crisp, sweet, and tart. Fuji is another variety with exceptional flavor. They will keep in for months in your refrigerator so stock up while you can! Layer the apple slices with slices of Boars Head honey maple ham. Trim the crusts off and cut the sandwich into four triangles. Served here with a garnish of watercress on Noritake Sweet Leilani china. 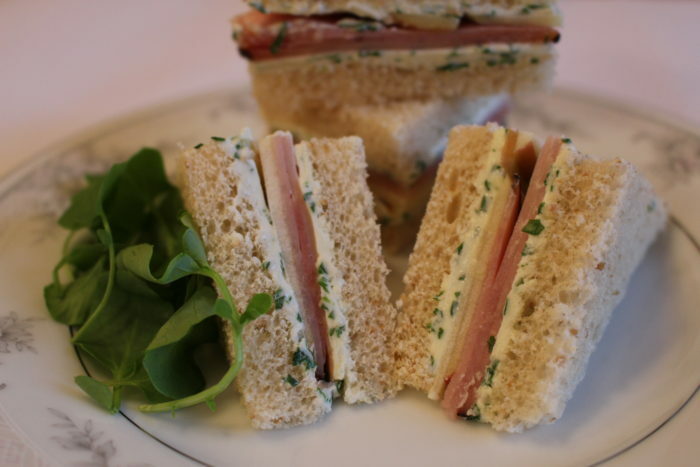 This sandwich pairs nicely with Apple Crumble Tea from Steeped Tea. Cheers!